Peter Bruhn, now 76, was studying at the Humboldt University in 1953 when he saw the demonstrations that were to make history - and change his life. He was working in the library on Unter den Linden, the heart of the city on the eastern side, when he saw the striking workers parade past in protest at the authorities. "I was fascinated that the workers were suddenly speaking out freely," he said. "There aren't many examples in German history of revolution and resistance against dictatorship - and that's the significance of the anniversary for me." This was late morning on 16 June, the day before the revolt was suppressed by Soviet tanks. 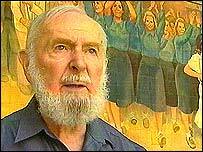 Mr Bruhn followed the demonstrators as they marched through the city, in open defiance of the regime. They were protesting against plans by the government to raise production quotas - effectively a pay cut for everybody. "In those days a strike by the workers, aimed against the government, was unthinkable," said Mr Bruhn. Eventually they arrived at the main government building, now the Federal Finance Ministry. This is where I met him, 50 years later. As we stood next to an old Socialist mural that's still in place, he told how a government minister stood on a table on the square and tried to calm the crowds. "A small, skinny, building worker, in white overalls and a matching cap, got on the table, pushed the minister aside, and started to speak. "Up till now, the crowds had been rowdy. Now they were silent. "The worker said: We're not just here because of the quotas. "We demand that there's no punishment for the strikers and that political prisoners are set free. We want free elections and the reunification of Germany." This was the moment, said Mr Bruhn, when he realised something big was happening. "There was a hope we could let the Soviet occupiers know that we were unhappy with our government, and that they would be prepared to make concessions." But he was not surprised by the ensuing crackdown. "The surprise was everything that happened on 16 June! We marched back through the city, to Stalin Allee, and declared a general strike," he said. 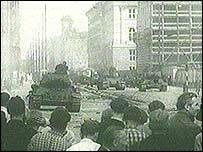 The next day more demonstrations were called and the Soviets responded with tanks. "The use of force showed that the uprising was so widespread they had no other means of restoring control," said Mr Bruhn. "But unlike most of my contemporaries, I didn't suffer. Late on the afternoon of 17 June, when the shooting had already started, I managed to escape into West Berlin." Mr Bruhn never returned to East Germany, and did not see his parents for years. He married and settled in West Berlin - and for years afterwards was only able to travel out by plane, for fear of being arrested if travelling through the East overland. "In the West, the anniversary of 17 June became a state holiday, but it was really just a day off for most people," said Mr Bruhn. "It's only since the fall of the Berlin Wall that people became interested in it again."